The Equus Asinus blog is a continuation of the blog I began in 2010 called Brother Lapin’s Pilgrimage when I left England at a turning point in my life, wondering what life would offer next. And life offered me donkeys! 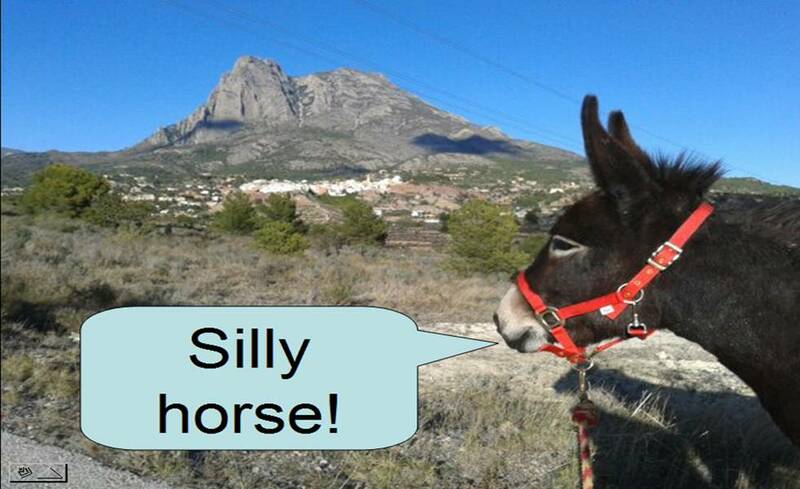 The narrative of that blog was about the way that life’s journeying and pilgrimage brought me to a settled life with four donkeys in Spain. 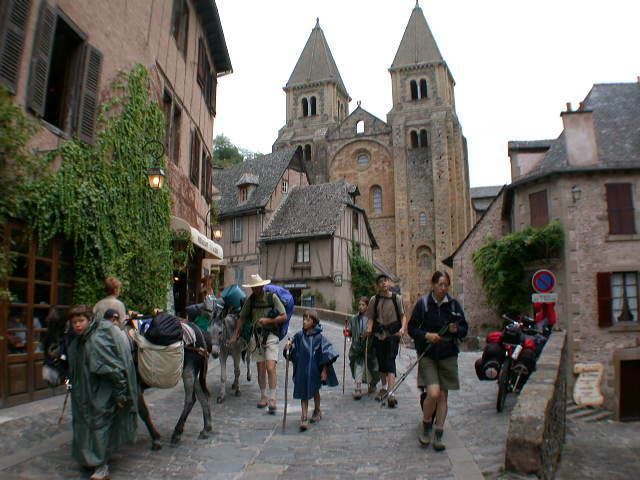 I first became aware of donkeys one rainy morning in Conques in 2006 when I was on route by bicycle from Canterbury to Compostela on the mediaeval pilgrim route via Le Puy. 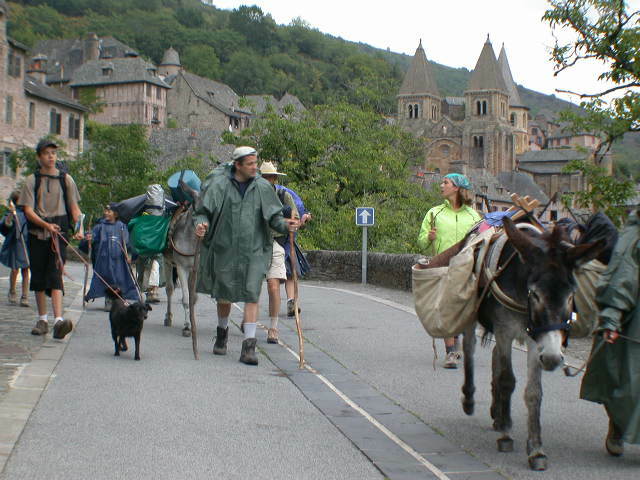 I had arrived at the abbey in Conques very late at night; too late to find accommodation or put up my tent in the steady drizzle. 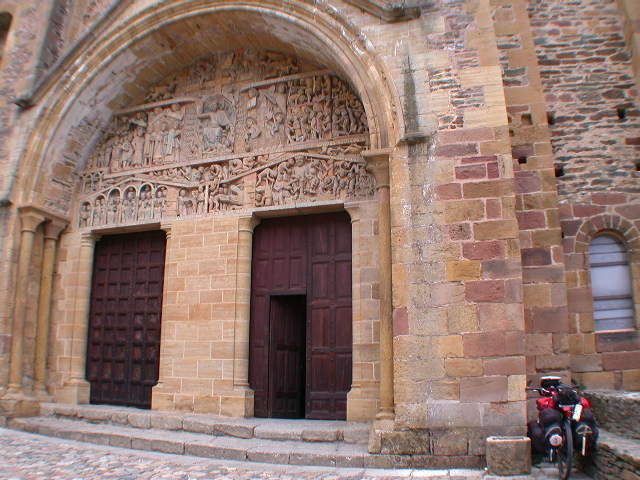 So I unrolled my sleeping bag next to the abbey of St Foy, and I slept soundly under the great Romanesque tympanum showing scenes from the New Testament. The bell woke me in time for 7 o’clock Mass which was celebrated by a Premonstratensian priest in a side chapel in the abbey. Then I went for breakfast of croissants and coffee in a café opposite. 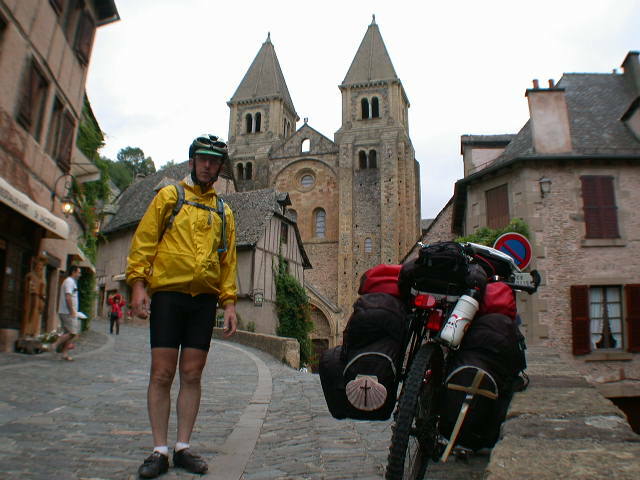 Before leaving to continue my ride south through the hills heading for the Pyrenees, I took a selfie in front of the abbey. As I stood there waiting for the self-timer, I heard the clip-clop of unseen hooves on the wet cobbles up the road behind me. 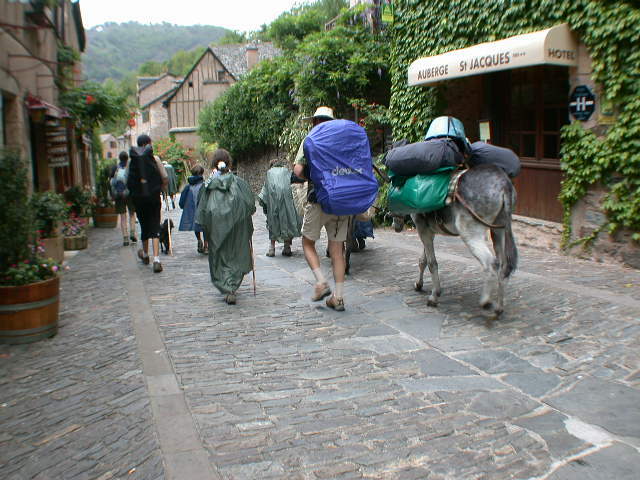 A sight that seemed to come straight out of mediaeval Compostela pilgrimage came into view: two families of walking pilgrims with children, all in rain capes, and two pack donkeys plodding slowly along with the luggage on pack-saddles. I wrote very briefly about that moment on my previous Brother Lapin’s Pilgrimage blog: “Welcome to Brother Lapin’s Pilgrimage. 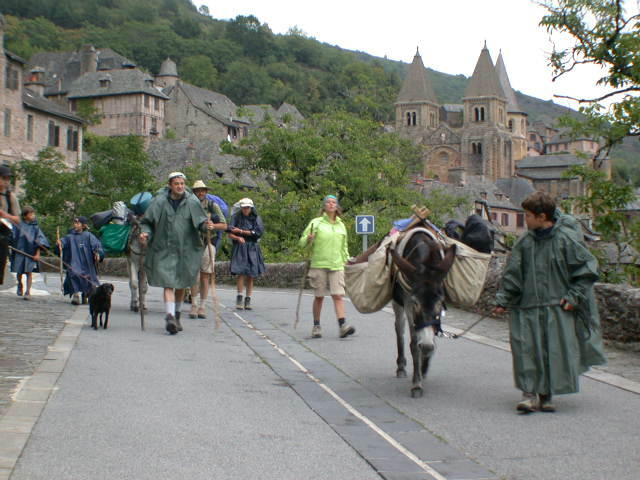 I first saw pilgrims walking with donkeys on a rainy day in Conques in 2006 and the wonderful sound of donkey hooves clattering on the cobbles was immediately appealing.” The photographs had disappeared for several years, as I wore out several computers, and backups of my photos had sometimes been unsystematic, so I believed the Conques donkey photographs had been lost. As I prepared this new blog Equus Asinus, I searched through dozens of unmarked CD-ROM disks, and I finally located copies of these photos. As I saw these pictures for the first time in many years, all the feelings of that moment came flooding back. The pilgrims carried on down the hill, out of Conques and out of sight, and when I cycled down the road to continue on my way, they had disappeared, for they were probably following a Compostela walking path through the forests while I was confined to tarmac with my impossibly overloaded bicycle. I held the image of them in my mind as I pedalled along on the next stage towards Spain and Santiago de Compostela. It had been more than a pleasant sight: something had occured in me. As we continue on our journey through life, some events which we knew to be significant but did not know why, become clearer in the light of events that followed. 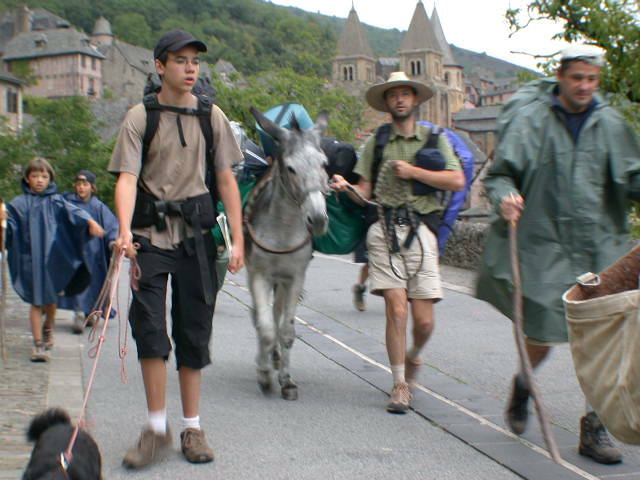 In Part 2: Walking with Dalie, I explain the next donkey encounter two years later.